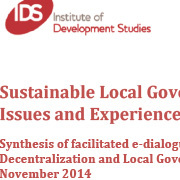 In November 2014 ddlgn members engaged in an e-discussion on "Sustainable Local Government Financing: Issues and Experiences" [PDF], organised by ddlgn with the facilitation of IDS. The sessions focused on: i) the financing mix of local governments, ii) other sources of finance at the local level, beyond taxes and transfers iii) taxation and the social contract/accountability and iv) the possible impacts of different sources of financing on political and economic outcomes. Selected examples emerging from the e-discussion (Serbia, Kosovo and Mozambique) have been further analysed. 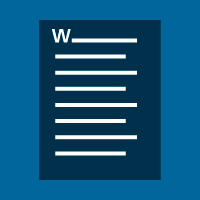 (See working paper perspectives from the field, 2016). In a joint collaboration with the gendernet during 2015 an e-based stocktaking on gender and fiscal decentralisation has been conducted (May 2015) and an e-discussion on gender and taxation organised, with facilitation by IDS (September 2015). (See the summary reports). During the ddlgn f2f in Pemba in June 2015 network members engaged in joint learning and discussion on the topic of fiscal transfers. 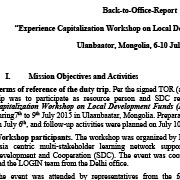 This included expert inputs on definitions and concepts and the presentation, discussion of peer contributions from several countries. In March 2016 ddlgn in collaboration with IDS organised a learning retreat on Subnational Taxation and Financing for its members. The programme included expert inputs on basic concepts, presentation and discussion of IDS research findings and of SDC peer experience. You can find all related documents here below. 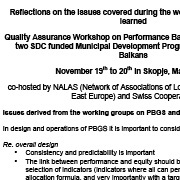 Quality Assurance Workshop on Performance Based Budget Support in two SDC funded Municipal Development Programs in the Western Balkans. Reflections on the issues covered during the workshop- and lessons learned. Final draft. 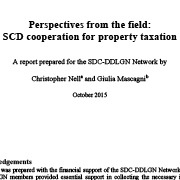 This paper aims to highlight practical problems and obstacles linked to the collection of property tax, and pragmatic ways in which local tax revenues can be boosted. 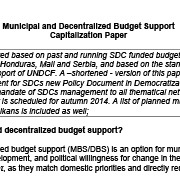 This paper has been elaborated based on past and running SDC funded budget support programs for municipalities in Nicaragua, Honduras, Mali and Serbia, and based on the standard good practice guide for decentralized budget support of UNDCF.